A meeting of sun hats! 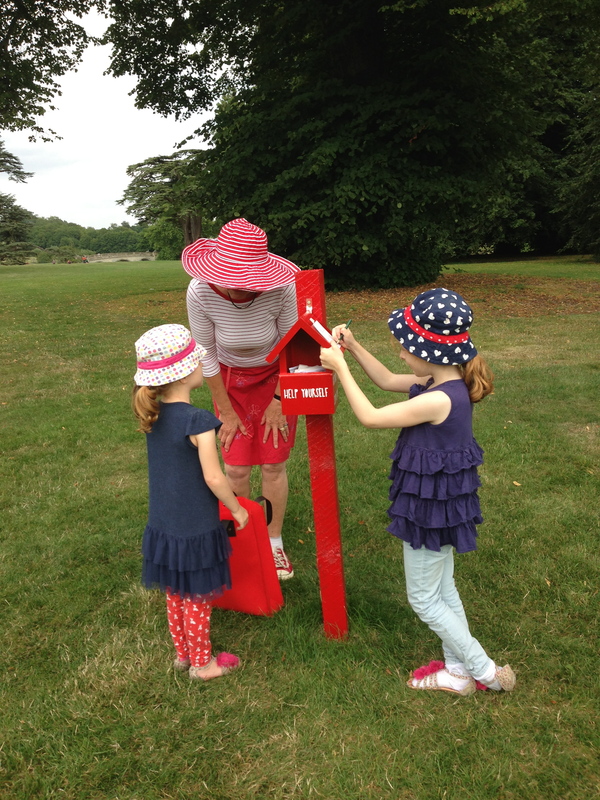 The latest participants in my visitors survey of Compton Verney. Sadly only three more days of my Creative Walks , but the survey map that I’m making of visitors drawings and writings is beginning to take shape. It is several years since I visited Compton Verney. I used to know it well. Returning this summer, I felt a stranger in the landscape – the gardens and architecture were familiar, but so much had happened there over the years. Traces of these activities and the people who had initiated and participated in them were ubiquitous. As James Joyce wrote: “places remember events” (2) and that was true of Compton Verney: layers of activity had transformed the site from a hidden treasure (a decade ago) into a buzzing cultural centre. In fact, Compton Verney has a long history of responding to change and re-defining itself, evolving from family home to a smoke school in WW2, from dereliction to archaeological investigation. It is this texture of events – large and small – which contribute to Compton Verney’s unique sense of place. 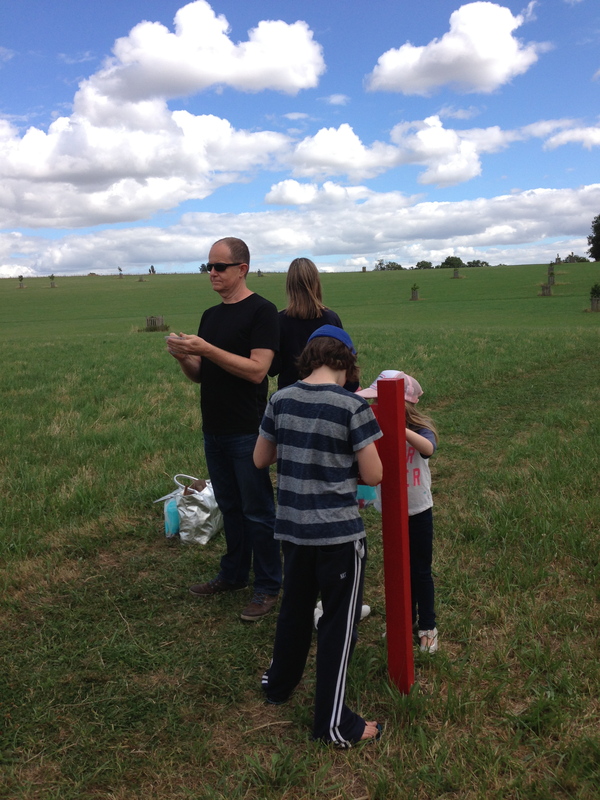 Many site surveys of Compton Verney exist, but ‘The Contemporary Surveyor of Compton Verney’ by Jo Roberts (presented as part of the group exhibition Re-viewing the Landscape: a Contemporary Response, 13 July – 22 September 2013) offers an alternative, personal exploration and representation of this place. Roberts spent an intensive residency period at Compton Verney and knows it well. Her conversations, observations, walks, research and drawings charted everything that happens here. These have been distilled into a large wall installation, heavily inspired in format by James Fish’s survey of the site in 1736, built up of separate sheets of paper. Roberts creates an annotated map of memories and traces, assembled from carefully crafted paper fragments, layered and pinned. 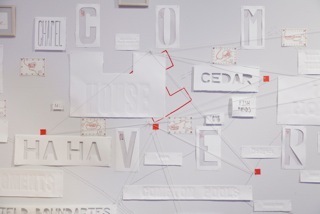 The fragments are numerous and include embossed and cut-out text, ink drawings, real and imagined maps and distinctive line. Our eye darts around the textured map and takes us on a journey back, through, amongst, around, in-between and around Roberts’ Compton Verney. At times we are enticed inside with views through to miniature maps, negative spaces revealed, snippets of conversation, lines that lead nowhere and sketches of people we don’t quite recognize. Like all professional surveyors, Roberts’ job is to ‘examine the condition of land and buildings’(3) and here condition goes far beyond the physical structure of Compton Verney’s gardens and house, it is about what and who animates and interacts with the site. This remarkable, fragmented document retains and defines with satisfaction a strong sense of Compton Verney as it is this Summer, 2013. A family at Viewing Box No 2 recording what they can see as part of my survey of Compton Verney, fascinating to see the wonderful drawings and insightful writing visitors are doing. 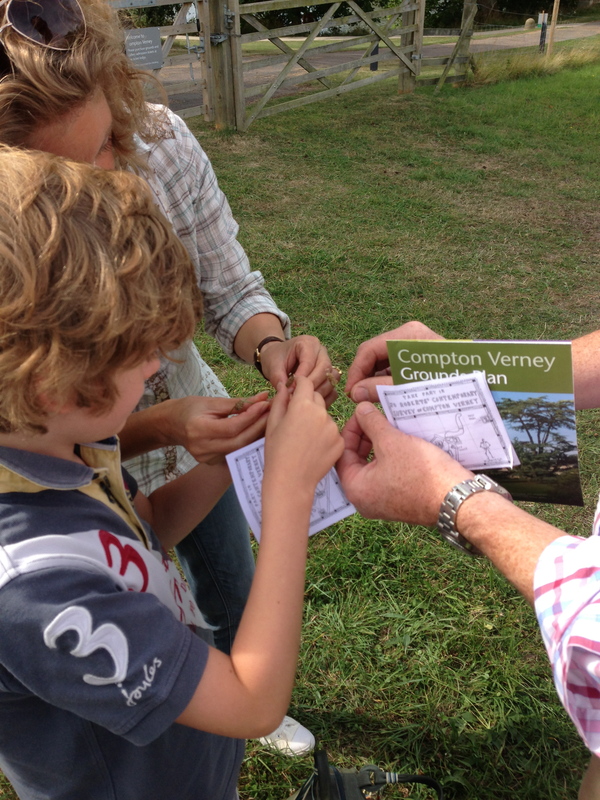 For me, this is what ‘The Contemporary Survey of Compton Verney’ is all about. 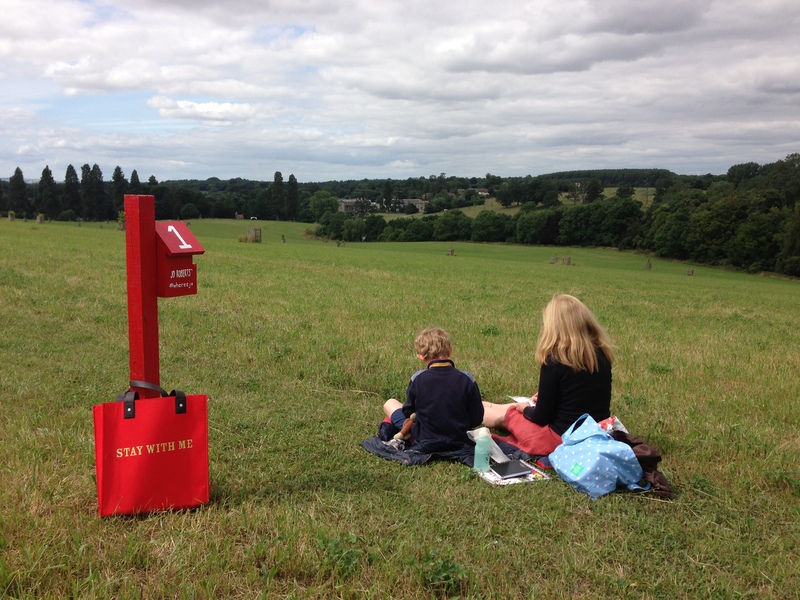 A mum and her son walk to Viewing Box No1 at the top of East Park, to record the landscape in front of them looking down on the house – the mum by drawing, the son by writing. Their contributions have now been added to the visitors survey, something that all ages are participating in.